Coil coating impart beautiful topcoats, durable surfaces, innovative applications, green benefits, and cost savings as compared to other substrates and other coating options to meet the commercial goals and provide highest quality standard products. Nearly 20 million tonnes of steel and 2 million tonnes or so of aluminium and other substrates are coated annually around the world using the coil coating process. Goldstein Research analyst forecast the Coil Coatings Market size is set to reach USD 7.5 billion by 2024, at a CAGR of 5.76% over the forecast years. Coil Coating properties like stain resistance, corrosion resistance and flexibility compared to conventional coatings is expected to drive the global market growth over the forecast period. On the basis of end user industry, building and construction segment is projected to remain the dominating market. Building & construction industry acquired 45% of the total market share followed by automotive, appliances and others in 2016. On the basis of application, steel held the market share of 73% in 2016 while aluminium would spur growth for this segment over the forecast period. Based on geography, APAC held the largest coil coatings market share i.e. 40% in 2016 due to high economic growth rate followed by heavy investment across end-user industries such as building and construction, appliance, automotive, and others. Japan, China and India along with Thailand, Malaysia, Indonesia and Philippines, has presented sound opportunities for coil coatings due to governmental regulations and proposals for improvement of infrastructure, rising automotive demand in Japan and the rising housing market. Bulgaria, Czech Republic, Russia, Belarus, Mexico and Romania are witnessing high construction growth. Construction recovery, growing automotive and pharmaceutical industries in the U.S. is anticipated to further fuel the North American coal coatings market growth. While Europe coil coating market tends to grow at the fastest CAGR of 6.23% over the forecast period attributed to important developments, expansions, agreements, and mergers & acquisitions of the leading global companies. According to the report, major driving factor for Coil Coatings Industry is the cost-effective solutions as coatings based on polyester resins can be resilient, permitting them to withstand deformation processes, but can also be designed to be very hard and tough. They feature a balance of surface properties such as flexibility and scratch-resistance – while also being very economical. Further, the report states the major challenge is Increasing metal substitution with engineering plastics such as polycarbonate not only in automotive industry but also in the areas of household appliances, construction and infrastructure. For instance, Asian economy has been thriving primarily due to advancements in the traditional sectors of automobiles, building and construction, business machines, electrical & electronics, household appliances, telecommunications and transportation. Engineering Plastics are increasingly used in auto parts, consumer goods and electrical & electronics applications. 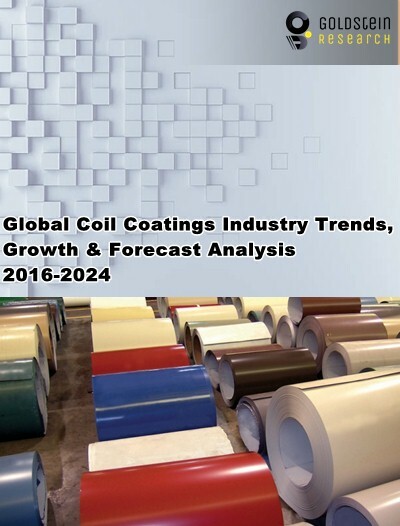 The report covers the present ground scenario and the future growth prospects of the Coil Coating Market for 2016-2024 along with data related to the usage of Coil Coatings in different verticals. We calculated the market size and revenue share on the basis of revenue generated from major players across the globe. Coil Coatings Market Outlook 2016-2024, has been prepared based on in-depth market analysis from industry experts. The report covers the competitive landscape and current position of major players in the global Coil Coatings Market. The report also includes porter’s five force model, SWOT analysis, company profiling, business strategies of market players and their business models. Global Coil Coatings Market report also recognizes value chain analysis to understand the cost differentiation to provide a competitive advantage to the existing and new entry players. Our global Coil Coatings Market report comprises of the following companies as the key players: Akzo Nobel N.V., The Valspar Corporation, Beckers, PPG Industries, kzonobel, PPG Industries Inc., DuPont, Henkel AG & Co., Kansai Paint Chemical Ltd., The Sherwin-Williams Co., Wacker Chemie AG and BASF. What is the revenue of Coil Coatings major market players in 2015-16 and what would be the expected demand over the forecast period? What are some of the most promising, high-growth opportunities for the coil coatings market by end use industry type (Building & Construction, Automotive, Appliance, and others), resin type(Polyester, Fluoropolymer, Siliconized Polyester, Plastisol, and others) application type(Steel and Aluminum) and region(North America, Europe, Asia Pacific, and Rest of the World)?